Amazon is the worlds leading online retailer and its success has spurred other physical, brick, and mortar retailers to have an online presence. It is often referred to as the online equivalent of Wal-Mart because of its reach and global footprint as well as its aggressive pricing strategies. Amazon can leverage on several opportunities in the emerging markets and can ensure that its global supply chain of networked warehouses deliver substantial value for itself and its stakeholders. Further, Amazon has to rethink its business model of operating at close to zero margins and the fact that the company has not returned a decent profit in the last five years gives it much room for improvement. Being the worlds leading online retailer, Amazon derives its strengths primarily from a three-pronged strategic thrust on cost leadership, differentiation, and focus. This strategy has resulted in the company reaping the gains from this course of action and has helped its shareholders derive value from the company. Amazon primarily derives its competitive advantage from leveraging IT (Information Technology) and its use of e-Commerce as a scalable and an easy to ramp up platform that ensures that the company is well ahead of its competitors. Using superior logistics and distribution systems, the company has been able to actualize better customer fulfillment and this has resulted in Amazon deriving competitive advantage over its rivals. In recent years, Amazon as part of its diversification strategy has been spreading itself too thin meaning that it has allowed its focus to waver from its core competence of retailing books online and allowed itself to venture into newer focus areas. While this might be a good strategy from the risk diversification perspective, Amazon has to be cognizant of losing its strategic advantage as it moves away from its core competence. As Amazon offers free shipping to its customers, it is in the danger of losing its margins and hence, might not be able to optimize on costs because of this strategy. Considering the fact that Amazon is an online only retailer, the single-minded focus on online retailing might come in the way of its expansion plans particularly in emerging markets. One of the biggest weaknesses and something that has been oft commented upon by analysts and industry experts is that Amazon operates in near zero margin business models that have severely dented its profitability and even though the company has high volumes and huge revenues, this has not translated into meaningful profits for the company. By rolling out its online payment system, Amazon has the opportunity to scale up considerably considering the fact that concerns over online shopping as far as security and privacy are concerned are among the topmost issues on the minds of consumers. Further, this would improve the companys margins as it lets it reap the advantages of using its own payment gateway. Another opportunity, which Amazon can capitalize on, relates to it rolling out more products under its own brand instead of being a forwarding site for third party products. In other words, it can increase the number of products under its own brand instead of merely selling and stocking products made by its partners. The fourth opportunity, which Amazon has, is in terms of expanding its global footprint and open more sites in the emerging markets, which would certainly give it an edge in the uber-competitive online retailing market. One of the biggest threats to Amazons success is the increasing concern over online shopping because of identity theft and hacking which leaves its consumer data exposed. Therefore, Amazon has to move quickly to allay consumer concerns over its site and ensure that online privacy and security are guaranteed. Because of its aggressive pricing strategies, the company has had to face lawsuits from publishers and rivals in the retailing industry. The obsessive focus on cost leadership that Amazon follows has become a source of trouble for the company because of the competitors being upset with Amazon taking away the business from them. Finally, Amazon faces significant competition from local online retailers who are more agile and nimble when compared to its behemoth type of strategy. This means that the company cannot lose sight of its local market conditions in the pursuit of its global strategy. Amazon has its task cut out as far as its future strategies are concerned and this SWOT Analysis can provide a guide and a roadmap that the company can implement going forward. 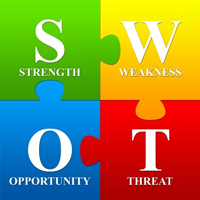 The key take away from this SWOT Analysis is that Amazon has to focus on profitability and not volumes alone if it has to be competitive in the future where volumes and market leadership are not alone to add value to its stock.